Recently on a social media page devoted to fiber arts a person posted that they were “attacked” by natural dyers at fiber event because their wool was colored with synthetic dyes. I do not know this person and I would have no reason to doubt their word. I do suspect the word “attack” may be a little strong and used for dramatic effect. Immediately there was a long string of commentary and it was very anti- natural dye, anti-mordant and overwhelmingly these comments were made by people that had, in fact, never actually dyed anything naturally. This is not the first time I have seen something like this happen. The majority of fiber artists use synthetic dyes and appear to feel uncomfortable with those of us who use natural dyes exclusively. The major theme repeated is how mordants are not safe. Natural dyes are dangerous! In that particular thread there were even very random criticisms like this- (paraphrasing) “I am an avid hiker and enjoy being outdoors. I use synthetic dyes because they are safer, faster and I don’t have all that time to spend looking for plants!” That one gave me pause. How pleasant would it be to collect plant material while you are hiking. The point is there seems to be strong a kneejerk reaction to natural dyes often without actual facts. Mordants are mineral salts used to create a bond between a fiber molecule and a dye molecule. Most commonly used are iron, copper, tin, alum (potassium aluminum sulfate) and chrome. The toxicity of these metals is all relative to their concentrations and that is often where the confusion lies. There are many things we ingest that can prove toxic in larger amounts. As a small scale natural dyer, I use relatively small amounts of these metals. (About 3 tsp. per lb.) If I use appropriate amounts of mordant per lb. of wool that I dye, I am left with 30-70 % left in the dye water exhaust.. I simply store the leftover dye vats and reconstitute them with 1/2 to 3/4 the amount of the mineral salt that I initially used. There is 0 negative impact to the environment. 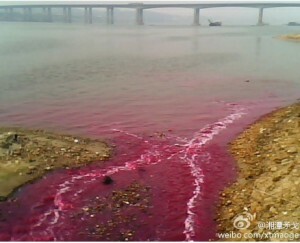 0 dye effluent released in to the environment. Synthetic dyes are derived from coal tar, a carcinogen. They are touted as “safe.” There is a company called Greener Shades that purport to be completely metal free and safe. This makes everyone happy and many people use these dyes unquestioningly. I am certainly not trying to pick on any one company! The question that is never asked by dyers is where do these dyes come from, how are they made, where are they made, who is making them and what exactly do they contain. The textile industry is very secretive! Recently an herbalist/soap maker and new friend of mine shared info about Wen cosmetics on her Facebook business page. Wen claims to be all natural but in reality is far from it! There are many companies like this. I commented about greener shades dyes and posed the same questions about how they are made etc. I must have struck a nerve. Another alpaca farm near me posted their own commentary on their business page after reading mine. While I would question the wisdom of calling someone stupid on your own business page, as I don’t think it endears potential customers to your brand, I am using the direct quote to emphasize the hyperbole that often is expressed when one questions synthetic dyes. We need to ask the questions! We are told that glycophosate (Round-Up) is safe. People use it without worry to slay weeds. We are told it does not persist in the soil, yet there are studies that prove it does! An MIT professor believes it may be an underlying cause of autism. We should ask where synthetic dyes are made and who is making them. We know much of the textile industry has moved overseas where there are relaxed pollution standards and many very low wage earners available to work in textile factories. They are exposed to many dangerous compounds and there does not seem to be much corporate responsibility in regard to their well being. I believe it is too simple to just blast mordants every time someone mentions natural dyes. I dispose of zero waste water, I grow many of my own dye plants and I source ethically when needed. To my mind, this makes mordants far safer and much better for the environment. 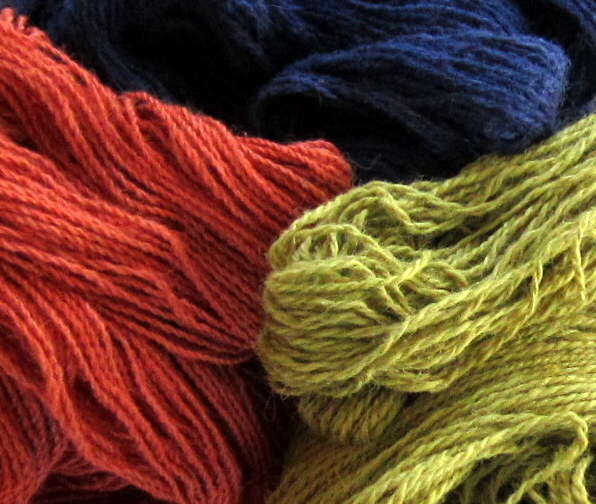 While I do realize we live in a world where it is impossible to avoid synthetically dyed clothing, I think fiber artists and knitters, could become a bit more open to the idea of natural dyes in their work. We all want to know where our food comes from. Should we not know where our dyes come from. This entry was posted in Alpacas and Farm Life, Naturally Dyed Yarns and Products and tagged Agriculture and Forestry, farming, fiber, fiber arts, fiber fleece wool natural dyes sustainability local alpaca yarn knit spin Maine, hand spun, knit, knit knitting, Maine, natural, natural dyes, plant dyes, synthetic dye, textiles, Textiles and Nonwovens, yarn. Bookmark the permalink. Thank you for making us aware of this. I don’t get out much-we live too rural, but to attack someone using natural dyes is unreal to me-I do both along with just getting into nature printing too–I only use the safer mordants and would not use tin or some others do to them being more difficult to safely use but to just attack someone over one method or another is just wrong and close minded. Hi Kathy, I too, primarily use alum as a mordant, but I like how tin brightens colors. Remember, it is the amount used and at what concentration. I save my wastewater after I mordant and for tin reconstitute with 3/4 the amount, figuring about 1/4 of the tin is left afte I have mordanted my wool. since the waste water is saved it has no impact on the environment. It is easy to store it safely. Thanks for getting in touch! I feel the reason people have such a knee jerk reaction to natural dyed fiber is guilt. Guilt that they don’t use or purchase them. Also, I think people are lazy and do not try to discover facts for themselves, but rather repeat what they have heard from others (even if they are not a reliable source.) Misinformation seems so widespread. I took a spinning class at our local Weaver’s Guild and the teacher there told me natural dyes were not natural or safe. I mean really how are plants not natural? And with regards to alum – it’s sold as food in a grocery store, our houses have copper pipes that leach into our drinking water, iron is a mineral supplement many people take, tin was used to line copper pans and is the main metal in modern day pewter which is considered food safe. Of course these materials should be used as safely as possible (I love that you reuse your mordant water,) but they are not bad in and of themselves. Of course this is only my two bits. Thanks! you had another perfect example! You were told that natural dyes were not natural or safe!!! That is exactly the point. I had another wool farmer say to me they would not want tin or copper in their house! They were afraid. Yet had no problems opening a jar of synthetic dyes and dyeing wool in their kitchen and dumping the wastewater down the drain! It is so ingrained in people! In my natural dyeing experiences, I have not encountered the attitudes that you expressed, but I am not surprised that others have. I would love to see more natural dyers talk about conserving their mordants. Rebecca Burgess does this in her book Harvesting Color. The stats that you quote about the textile industry are eye-opening. I’ve long avoided endocrine disruptors from other sources–cosmetics, cleaning supplies, artificial fragrances, plastics, etc—after reading extensively about how damaging they are. This information has been known for a long time. But it does seem that the textile industry tends to get a pass. You just don’t hear about the dangers there the way you do with other products. I wonder why that is? While it is difficult (and very expensive) to buy only organic cotton or wool clothing, I do think one way to help curb the creation of new harmful textiles is simply to buy used clothing and to mend rather than buy new every time something wears a little. you have been fortunate! I think it is the great unknown. It hasn’t occurred to people yet to wonder about textile dyes. I think it is starting. I find the resistance mostly comes from fiber arts people. They should be able to know where the dyes they use are coming from. There is really no info out there. That says it all, I’m afraid! Dear Marcia, Thanks for the thoughtful comment about mordants and natural dyes. Natural dyers are in a unique position to understand exactly what goes into the color that they create, and they have the option of using plant mordants, less toxic mordants, or no mordants at all to create glorious color. This is a huge advantage and one that we often don’t think about. Synthetic dyers aren’t able to easily obtain detailed toxicological information with the colors that they use and I sense some discomfort given the state of environmental degradation that is happening using the very same dyes that are claimed to be “safe”. For all the folks who are hollering about the toxicity of natural dyes, it’s important to remember that all of the environmental mitigation that is happening in the industrial textile sector centers around the pollution caused by synthetic dyes and textile finishes. Many of the dyes and chemicals used in the textile industry persist in water, are considered dangerous to human and aquatic life, and pose a serious threat to our limited water supply. It’s alarming to think that not only are we wearing it but some of us also willingly work with these types of substances. One of the things to remember about the dyes that are now being marketed as “heavy metal free”: this means that they used to contain heavy metals, and back in the 80’s, we were all using them. It’s challenging to take a hard look at our art materials and decide that there is an environmental aspect to our work that can’t be ignored. It means rethinking where we source the yarn, fabric, paint and dye. We have to think about growers, laborers, chemicals, energy, water and make some hard decisions, when all we really want to do is put color on fiber. There are many choices we make that are not perfect, but that doesn’t negate our inquiry and practice. It is still a critical and important step to take to create a sustainable textile journey. I’m very happy to see that you are asking lots of questions and are open to the responses from all sides. I appreciate you getting in touch and sharing your thoughtful, measured comments. Another aspect about natural dyes that is not environmentally related is the color! As a fiber artist, I prefer the colors I can achieve with natural dyes.